MSA-Gruff and Flanagan Lawrence, the practices of Bartlett School of Architecture tutors Rhys Cannon, Matthew Springett and Paul Bavister have been named as finalists in the AJ's 2015 Small Projects shortlist. A wind tower by MSA-Gruff and a shell-shaped performance space by Flanagan Lawrence were revealed in Part 1 of the AJ shortlist which features the first 12 projects costing between £0 and 125K shortlisted in this year's AJ Small Projects Award. The £40,000 'Wind Tower' (pictured above) was created by Bartlett BSc Architecture UG8 Tutor Rhys Cannon (Director of Gruff) in collaboration with Bartlett alumnus Matthew Springett (Director of MSA). 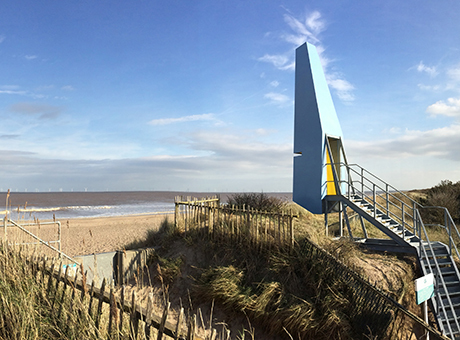 Sited on the Lincolnshire coast, the tower explores the nature of the site’s extreme environment at the point at which land, sea and air interact in a shifting and ever-changing marine landscape. Flanagan Lawrence's £100,000 'Acoustic Shells' project (featured above), led by Bartlett Technical Tutor Paul Bavister, opened in Littlehampton last summer. The 20m² seafront shelter and performance space for Littlehampton Town Council features two curved, sprayed concrete shells each facing opposite directions. All the shortlisted architects will present their schemes in front of a judging panel before a winner is revealed on the 18 March. The finalists designs will all go on display in an exhibition at the Building Centre on Store Street from 18 March to 11 April.